The world experiences an abrupt and unthinkable cataclysm on the morning of October 29, 2018. Kevin March, high school band trombonist and wannabe writer playing hooky, is witness to its beginning. To stay alive, Kevin embarks on a journey that promises to change everything yet again. On his journey, into a digital recorder he chronicles his experiences at the end of his world. This book is a transcript of that recording. Depicting an unspeakable apocalypse unlike any seen in fiction--there are no zombies, viruses or virals, no doomsday asteroid, no aliens, no environmental cataclysm, no nuclear holocaust--with a Holden Caulfieldesque protagonist at his world's end, The Late Bloomer is both a companion piece to Lord of the Flies and a Bradburyian Halloween tale. The Late Bloomer is harrowing, grim and poignant in the way of Cormac McCarthy's The Road. Told in Kevin March's singular and unforgettable voice, delivering a gripping narrative with an unsparing climax as moving as it is terrifying, The Late Bloomer defies expectations of the genre and will haunt those who read it. 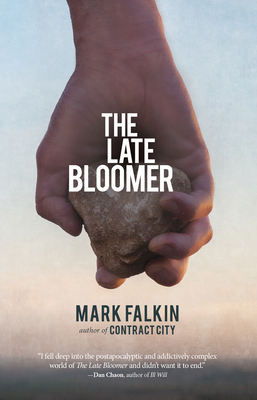 Mark Falkin is the author of the novels Days of Grace and Contract City. Though he remains a card-carrying member of the Texas Bar, he is a literary agent by day and oftentimes by night. He lives with his wife and daughters in Austin, Texas.